MINISTRY is NOT just causing the masses or an individual to go into a multiplicity of temporary moments escaping into emotional despair or a frenzy… This will only result in a temporary fix. Quite often it will cause an ongoing continual series of emotional roller coaster ups and downs. 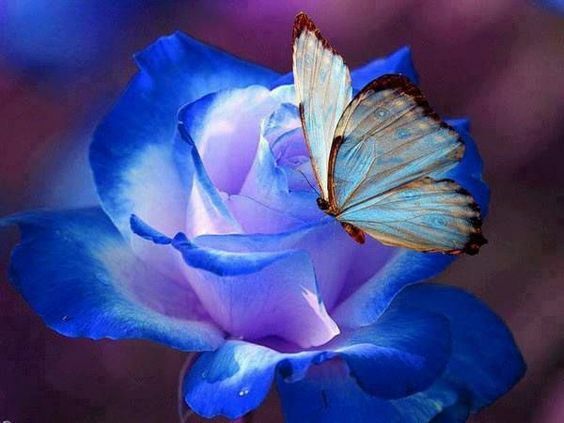 The person is often compliant to participate in the moment because they have a great need to feel accepted. MINISTRY is often inclusive of displays of heartfelt emotions. It should usher you into the spiritual atmosphere known as the PRESENCE of the LORD. Here your awareness is heightened. This is where strongholds are broken and many or one can be truly delivered, healed and set FREE. We must sincerely invite the infilling presence of the Lord within and seek His direction. MINISTRY is about how effectively you can encourage others to TRUST & BELIEVE in the LORD without manipulation. MINISTRY is dependent upon HIS HOLY SPIRIT. This should not be orchestrated or just for a visual effect. The intent is to make others aware of the Omnipresence & Omniscience of our Omnipotent Lord & Savior. To encourage them to seek to freely Worship our Lord in public corporate worship as well as private worship! We as His Ambassadors are to encourage individuals to desire to want to embrace THE TRUTH of HIS WORD into their daily lives! GOD WANTS each of us to render ourselves up to HIM as a vessel. To live out as well as IMPART HIS TRUTH via song, dance, preaching & teaching in such a WAY that the infilling power of HIS HOLY SPIRIT is quickened within or enters the hearts & minds of those who HE desires to reach…. HIS HOLY SPIRIT IS HIS COMFORTER! “If you KNOW that HE IS RIGHTEOUS you KNOW that everyone who does right is born of HIM! How GREAT is the LOVE the FATHER has lavished on us, that we should be called Children of GOD! And that we are! The reason the world does not know us is that it DID NOT know HIM! With GOD at your side you CAN become ALL that HE has created you to be! You CAN learn to discipline yourself and sin less with the aid of HIS Holy SPIRIT. Self~Control is part of the Fruit of His Spirit! He will manifest and multiply the Fruit of His Spirit within you. You CAN become stronger as your own unique self. Live a life of ministry. Daily ask for the infilling presence of HIS HOLY SPIRIT. Let the LIGHT of our LORD shine through you for everywhere you are HE IS with you. SURRENDER, BELIEVE & TRUST GOD. For only with GOD the impossible becomes POSSIBLE! Grace, Joy, Love & Peace in the Lord! Where Does God Dwell ? GOD Dwells In The Hearts of HIS People! Where the Spirit of the Lord is there is liberty. We in America have a freedom that you just don’t find in the rest of the world. We have freedom of speech, freedom to vote, freedom to live and go where and when we please. But most importantly we have the freedom to worship. There are many types of worship services but there is only one true God. The only way to worship Him is in Spirit and Truth. On our many journeys throughout the world the LORD has allowed us to see many marvelous things. On them all the presence of the LORD has been apparent. On our trip to Athens Greece and Istanbul Turkey I was able to see some of the world’s most exquisite architecture. Turkey is a country that is 95% Moslem. 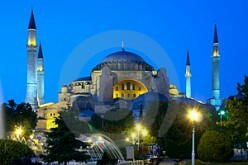 In Turkey there is the renowned Hagia Sophia Cathedral. It was built for the Christian community to reflect the beauty that Solomon’s Temple once beheld. In spite of its elaborate intricate handiwork full of gold mosaic tiles, marble and brick walls, it is now a museum. Lord Help us! It also contains various artifacts derived from Greek mythology and its continence is a shadow of it’s once intended purpose. Ironically across from it is the beautifully kept Sultanahmet mosque. Its known as the Blue mosque due to an extravagant array of blue mosaic tiles. Adorned with its intricate splendor and stately statueous marble columns and stained glass windows. It is scrupulously maintained and it is a place of worship for the Moslem community. Turkey is full of ornately designed mosques and Mohammed is whom they worship. Words cannot express my gratitude to God for the things my eyes have beheld. 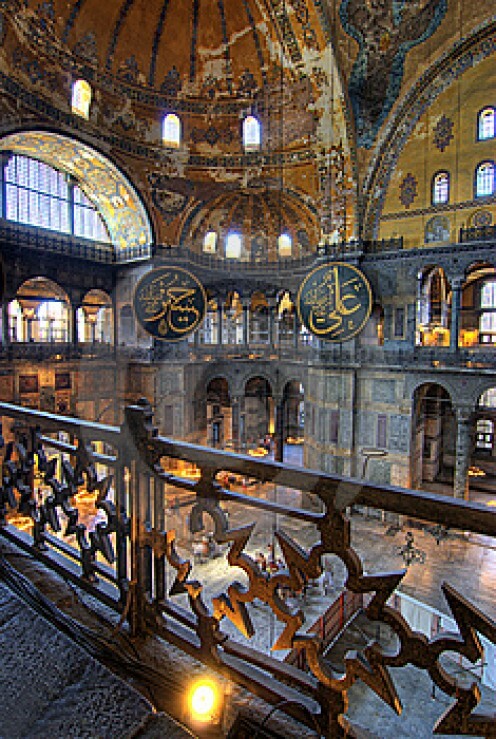 The scriptures continuously came to my mind as I/we walked through the Hagia Sophia. “God does not dwell in a temple made by hand’s” In His time; “God is coming back for a CHURCH without spot or wrinkle.” “It is in HIM we live & move and have our being…” Acts 17 “Where the SPIRIT of the LORD is there is liberty…” We can not confine GOD & HIS majestic magnificent omnipresence to the confines of a structure made by human hands no matter how large. Yes we can worship the Lord within the walls… There is nothing I enjoy more than a Spirt-filled Worship & Praise Service. But GOD’S CHURCH consists of HIS people from ALL over this world. God lives within the hearts of HIS people that have accepted HIS SON JESUS CHRIST into their hearts as SAVIOR & LORD!!! Our bodies are the Temple of the living God. We must ask continuously for the infilling presence of HIS HOLY SPIRIT! There is absolutely no doubt in my mind to the unmerited grace the Lord has bestowed upon all of us. Truly the Lord Is patient, loving & kind. We had a most interesting journey. The one thing the tour guide who was of Moslem decent (in Turkey along with our guide we were required to have a Turkish guide as well) said that stuck with me was “why would a powerful God allow His Temple to turn into a museum?” I could not help but respond and say; GOD IS AWESOME! HE IS THE ONLY TRUE GOD! “God does not live in a Temple made by the hands of man…” My point is and was God is so gracious and kind that He allows us so much freedom. He even gives us the freedom to choose who or what we want to worship. God wants HIS true worshipers to Worship HIM everyday; “In SPIRIT & in TRUTH!” Whenever or wherever I lift up Holy Hands, to Him and Him only my heart is eternally grateful. It is by His Grace and His Grace alone are we saved. We are not SAVED by our works… God is truly worthy of all the PRAISE! Above GOD is no other. Our GOD IS OMNIPOTENT, OMNISCIENT & OMNIPRESENT! In Turkey is the city of Ephesus. There are miles and miles of ruins. Original artifacts, columns etc. and remains to testify to the fact Ephesus existed. To this day approximately only 10% of it has been uncovered. It is still currently under excavation. Primitive hand tools are used in order to preserve whatever archeological finds are uncovered. This was such a memorable experience to see and witness. The Apostle Paul wrote the book of Ephesians to the church at Ephesus. Just look at God! Despite the fact Turkey is a Moslem country Ephesus remains a monument to Christians of God’s eternal presence, grace and mercy. Some of my most invigorating spiritual enlightening moments were spent in Athens Greece. Here I hold dear to heart many cherished memories. We together walked up the steep incline to the Acropolis saturated with aged columns made of marble. The Parthenon and majestic ruins were filled with slippery marble laden paths. The highlight was when I observed my husband humbly climb on his hands & knees up “Mars Hill!” The infamous hill that the Apostle Paul speaks about in the book of Acts. How interesting when we approached Mars Hill there was a woman preaching to a congregation out in the open, under the beautiful canopy of the blue skies. Once my husband determined it was safe I too climbed up on my hands and knees to meet him and we together Worshiped, Praised & Thanked the Lord for ALL HE has done, for ALL HE is doing and for ALL HE WILL DO! The Book of Acts teaches us; “And it will come to pass in the last days saith God I will pour out of my Spirit upon all flesh and your sons and your daughters shall prophesy.” Paul spoke concerning an altar with an inscription representing the unknown god on Mars Hill. That unknown God happens to be the God of Abraham, Isaac and Jacob I love, worship and adore. The only true and living God. He is truly the Great “I AM!” The Lord is Jehovah Raah meaning; My Shepherd! Mars Hill today is in a magnificent open place. High above Athens for all to see. (I will forever cherish what it felt like sitting there and praising God for all He has done!!!) I AM NOT ASHAMED OF THE GOSPEL! It’s walls and canopy are the blue firmament that God Himself spoke into existence through the Living Word. That Word is Jesus Christ wrapped in pure sinless flesh. Who sacrificed His life for the sins of the entire world!!! The gates of hell will not prevail against the Church of God. Glory! Glory! Halllelllujah! HIS TRUTH is marching on!!! “The earth truly is the Lord’s and the fullness thereof the world and them that dwell therein.” There is not a place that can be built that can contain the fullness of God’s majestic awesomeness. The earth is His mere footstool. The early church had no building they met in homes. We have dedicated our home to be a place where God’s way prevails. It is important to keep God as the Center of your marriage, family and life. The heart of each of His Children is where His true Church abides. There is nothing wrong with a church made by hands. But the focal point should not be a hierarchy laden with cliques, clichés, how do we pay our bills programs and solemn auxiliaries; a mere shadow of what God originally intended. It is so very important to know GOD and HIS WORD for yourself. There is only One Worldwide International Christian Church in the eyes of the Lord! “Where the Spirit of the Lord is there is liberty.” We should praise Him in song, WORD and deeds. No, we are not saved by works. But our works do display our faith. We are SAVED by HIS MARVELOUS GRACE! Our main focus should be to cultivate an environment where God receives the preeminence in everything. Whenever or wherever we worship & Praise the Lord we should leave with a desire to want to grow even closer to HIM! Christianity is supposed to be our daily lifestyle. We as believers can continue to grow in His Grace & Knowledge as we embrace and implement His principles within our lives until the day He calls us home. Then we get to live with Him through Eternity! Halllelllujah Amen!!! It is God’s Word and His power that will draw men, women, boys and girls from all cultures, creeds and colors worldwide. His Holy Spirit can and will change their lives when we sincerely spread this Awesome Gospel of Jesus Christ. Whether it be via TV, radio, internet; on Face Book, Instagram, Twitter or in song. As well as in person, taught, proclaimed or preached inclusively by the Spoken Word.